No one wants to spend a ton of money on seasonal decor, so it’s important to keep things budget friendly. 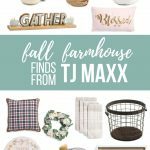 If you are love the farmhouse style and are looking to a few new pieces to your fall decor, you are going to love these fall farmhouse signs from T.J.Maxx. Much like my realization that H&M sold home products online last year, I’m sitting here scratching my head again and wondering HAVE I BEEN LIVING UNDER A ROCK?! I just discovered that one of my favorite stores in the world, T.J.Maxx, sells products online. Don’t get me wrong, there is almost nothing more I like to do more than strolling the aisles at T.J. However, anything I can do online or from a drive through lane these days is golden. I mean, most days by Noon I still haven’t showered and I’ve got spit up all over myself somehow (again). I can’t tell you how many times in the last few months I’ve asked myself “Now seriously when is someone going to invent drive through grocery shopping? !” Mamas, are you with me? All I’ve been wanting to do lately is make my home nice and cozy as we prepare for Fall and I’m in love with all things Farmhouse! So in the spirit of the season, I’m stepping up my online shopping game. Here’s some of my favorite Fall Farmhouse Finds that you can get online now at T.J.Maxx (or may stumble upon down the aisles of your local store). This fall farmhouse post contains affiliate links, but nothing that I wouldn’t wholeheartedly recommend anyway! Read my full disclosure here. Did you know that you could buy T.J.Maxx products online? Please tell me I wasn’t the only one in the dark on this!! 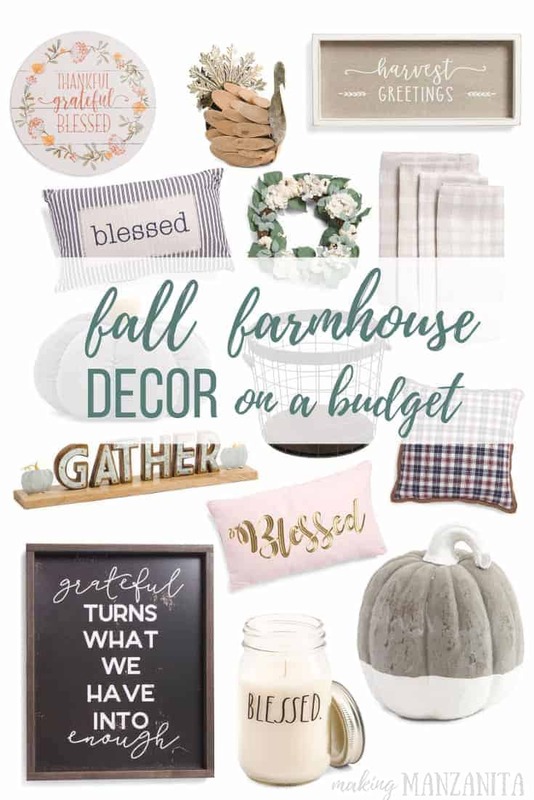 Didn’t that list of cute budget-friendly fall farmhouse finds make you want to embrace all the fall things?! Which one of these fall farmhouse finds is your favorite? I am really into Fixer Upper right now! I like too many of these pieces! I know Megan. Fixer upper style all day long over here!! Happy fall!